In recent years, our understanding of macromolecular transport processes across the nuclear envelope has grown dramatically, and a large number of soluble transport receptors mediating either nuclear import or nuclear export have been identified. Most of these receptors belong to one large family of proteins, all of which share homology with the protein import receptor importin β (also named karyopherin β). Members of this family have been classified as importins or exportins on the basis of the direction they carry their cargo. To date, the family includes 14 members in the yeast Saccharomyces cerevisiae and at least 22 members in humans. Importins and exportins are regulated by the small GTPase Ran, which is thought to be highly enriched in the nucleus in its GTP-bound form. Importins recognize their substrates in the cytoplasm and transport them through nuclear pores into the nucleus. In the nucleoplasm, RanGTP binds to importins, inducing the release of import cargoes. 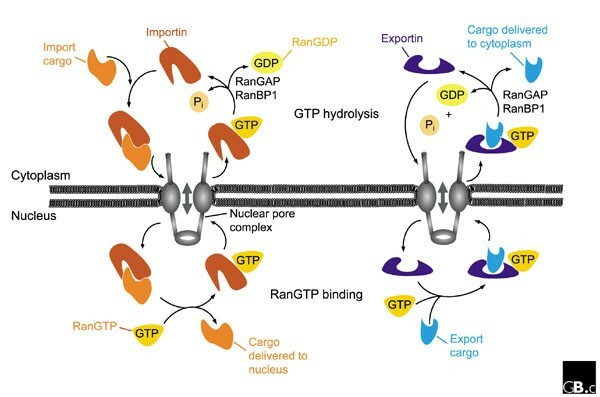 In contrast, exportins interact with their substrates only in the nucleus in the presence of RanGTP and release them after GTP hydrolysis in the cytoplasm, causing disassembly of the export complex. Thus, common features of all importin-β-like transport factors are their ability to shuttle between the nucleus and the cytoplasm, their interaction with RanGTP as well as their ability to recognize specific transport substrates. A major effort in the nucleocytoplasmic transport field has been directed towards the analysis of all members of the importin β family, in particular with the aim of identifying specific transport cargoes. This has led to the characterization of a large number of related proteins (both importins and exportins) in all eukaryotic species analyzed. New members have primarily been identified by sequence homology or biochemically via their interaction with the small GTPase Ran. Strikingly, the roles of many of these receptors is conserved from yeast to humans. There are 14 putative members of the importin β family in the completed Saccharomyces cerevisiae genome, nine of which have been shown to function as importins and four as exportins . The genes encoding yeast transport receptors are dispersed throughout the genome and none of them contains introns. Higher eukaryotes contain an even larger number of importin-β-like proteins. It has been proposed that there are more than 22 putative members in mammals [1,2,3]. Little is known about the gross structure of the genes encoding these nuclear transport receptors, and our knowledge of the chromosomal localization or the organization of the individual genes encoding members of this family is very poor. The relative molecular masses of members of importin-β-like proteins vary between 90 kDa and 130 kDa, but all are characterized by an acidic isoelectric point. The overall sequence similarity between various transport receptors is low (less than 20% amino acid identity) and, in many cases, is restricted to the amino-terminal domain. Work mainly on importin β has demonstrated that these receptors bind RanGTP via the amino-terminal domain and cargo via the carboxy-terminal domain [4,5,6,7,8]. To permit shuttling through the nuclear pore complex (NPC), transport receptors also contain one or multiple binding domains for components of the NPCs, called nucleoporins. Truncation studies using importin β indicate that the binding site for nucleoporins containing FxFG repeats (in the single-letter amino acid code, where x is, in many cases, a small polar residue or glycine) is located in an amino-terminal/central region of importin β (residues 152-352) [4,5]. This was recently confirmed in the crystal structure of an amino-terminal fragment of importin β in a complex with five FxFG nucleoporin repeats . Additional information comes from the crystal structures of importin β and of transportin 1 (also known as karyopherin β2), which were solved either in a complex with RanGTP [7,8], with a cargo , or in the free form . Overall, the structures of importin-β-like receptors are characterized by a very similar series of helical HEAT repeats (19 in importin β and 18 in transportin 1; Figure 1). HEAT repeats are approximately 40 residues in length and are found in many eukaryotic proteins such as the PR65/A subunit of protein phosphatase 2A . The fundamental repeat unit is a right-handed superhelical structure consisting of a hairpin made up of two β helices, named A and B, separated by a sharp turn. Each hairpin is connected to the next by a linker region. In transportin 1, almost all linkers contain a third helix, but there are very few linker helices in importin β. In both receptors, one turn is extended into a long acidic loop, which has been suggested to be important for RanGTP-mediated cargo release. Full-length importin β complexed with the importin-β-binding domain of importin α (IBB) forms a snail-like superhelical structure wrapping tightly around the IBB domain. The structure of the uncomplexed amino terminus of importin β reveals a different superhelical architecture with a much steeper helical pitch than the cargo-bound or RanGTP-bound forms . This suggests that importin β undergoes twisted conformational changes in its HEAT-repeat helix stacking, which could be essential for the regulation of cargo binding and release and/or for protein interactions during the translocation through the NPC. No structure of an exportin has yet been reported. Although the sequence homology is limited, it is expected that exportins will fold in a similar way to the reported importin structures. It still remains unclear, however, why RanGTP is required for binding of cargo to exportins but causes cargo dissociation from importins. Structure of importin β. (a) Importin β is composed of 19 helical-repeat motifs (HEAT repeats). Each consists of an A and a B helix connected by a short turn, which in HEAT-8 is replaced by an acidic loop critical for the regulation of substrate binding and release. The HEAT repeats 1-8 are required for high-affinity binding to RanGTP [4,5]. The importin-β-binding (IBB) domain of importin α interacts mainly with residues located in repeats 7-19 of importin β . The binding site for nucleoporins of the NPC is located between residues 152 and 352, corresponding to repeats 4-8 [4,5]. On the basis of the crystal structure, the A helices of HEAT repeats 5 and 6 and a region between HEAT repeats 6 and 7 are thought to be critical for recognition of the FxFG motif . N, amino terminus; C, carboxyl terminus. (b) Structure of importin β bound to the IBB domain of importin α (adapted from ). Importin β (yellow) forms a superhelical structure that wraps like a snail around the IBB domain (blue). The 19 HEAT repeats share a common core of 21 residues, comprising the A helix with about three turns and the B helix with about four turns. The helices critical for the interaction with FxFG-repeat nucleoporins  are in green. Important residues for interaction with RanGTP  are in red. Note the acidic loop, which contacts both RanGTP and the IBB domain (white arrow). A major function of transport factors of the importin β family is to mediate the transport between the nucleus and cytoplasm of macromolecules that contain nuclear import or export signals [1,12]. To this end, all transport factors constantly shuttle between the nucleus and the cytoplasm. At steady state, they can be found in the nucleus, at the NPC or in the cytoplasm. At present, very little is known about the tissue distribution of this family of proteins. All members have the ability to recognize and bind specific cargoes, either directly or via adaptor molecules, to bind RanGTP and to interact with nucleoporins at the NPC. Interactions between the proteins of the importin β family and nucleoporin repeats have been shown both in vitro [4,5,13,14,15,16,17] and in vivo . These interactions contribute to the import or export of importin β family members and their cargoes through the central transporter of the NPC. Import and export are multistep processes that are initiated by the recognition of nuclear localization signals (NLSs) and nuclear export signals (NESs). The most thoroughly studied import signals are the 'classical' and the bipartite NLSs, first identified in SV40 large T antigen and nucleoplasmin, respectively . Their transport is mediated by importin β, the first-characterized member of this protein family. Importin β indirectly associates with these NLS motifs via the adaptor molecule importin α [20,21,22,23,24]. Additional importin-β-dependent adaptors in vertebrates include snurportin 1 (involved in import of m3G-capped small nuclear ribonucleoproteins, snRNPs ) and XRIPα, (involved in the import of replication protein A, RPA ). Importin β can also form a complex with another importin-β-like factor, importin 7, in order to transport the linker histone H1 into the nucleus . In addition, importin β is able to interact directly with a large variety of different cargoes, including the T-cell protein tyrosine phosphatase , the human immunodeficency virus (HIV) TAT and Rev proteins , human T-cell leukemia virus Rex protein , ribosomal proteins L23a, S7, and L5 , cyclin B1 [32,33], Smad  and the parathyroid-hormone-related protein . Table 1 details known importins, exportins and their cargoes and adaptors. Abbreviations: H.s., Homo sapiens; S.c., Saccharomyces cerevisiae; X.l., Xenopus laevis. GenBank accession numbers are given in square brackets for each protein, and alternative names are in parenthesis. The import of ribosomal proteins seems to rely on at least partially redundant mechanisms. In yeast, the importin Kap123p/Yrb4p has been shown to be an important mediator of ribosomal-protein import [36,37], but the related protein Kap121p/Pse1p can functionally substitute for Kap123p in vivo . In mammalian cells, at least four importin-β-like transport factors are able to mediate import of ribosomal proteins . Interestingly, both the β-like importin receptor binding (BIB) domain and some ribosomal proteins can be imported by any of the four receptors importin β, transportin 1, importin 5 or importin 7 . The yeast importin Kap104p mediates nuclear import of the mRNA-binding proteins Nab2p and Nab4p . Its vertebrate homolog, transportin 1 (Kapβ2), also mediates import of the RNA-binding proteins hnRNP A1 and hnRNP F, but also of ribosomal proteins [31,39,40,41,42]. Mammalian transportin-SR mediates nuclear import of a group of abundant arginine/serine-rich proteins, which are essential pre-mRNA splicing factors [43,44]. In yeast, the TATA-binding protein (TBP) is imported into the nucleus by Kap114p . Other members of the importin-β family have been found to mediate nuclear export events. Exportin 1 (Crm1p, Xpo1p) has been identified in both yeast and higher eukaryotes as an export receptor for leucine-rich NES-containing proteins [46,47,48,49]. Human exportin 1 has been found to export protein kinase inhibitor α (PKIα) and HIV Rev , IκBα , snurportin 1 , HTLV Rex , the small nuclear RNA [46,53], cyclin B1  and the transcription factor NF-AT4 . Targets for exportin in S. cerevisiae include the transcription factors Yap1p , and Ace2p , the mitogen-activated protein kinase Hog1p , and the heat-shock protein Ssb1p . CAS (yeast Cse1p) functions in the export and recycling of importin α [60,61,62,63]. Msn5p was first identified as a yeast exportin that exports the phosphorylated form of the transcription factor Pho4p . Interestingly, Msn5p was recently shown to function as an import receptor for the trimeric RPA , suggesting that individual members of the importin-β-like protein family can function both as import and export receptors. The first cellular RNA export receptor to be discovered, named exportin-t in higher eukaryotes or Los1p in yeast, mediates nuclear export of tRNAs [66,67,68]. Many of the nuclear transport factors identified in S. cerevisiae are not essential for viability, even though they transport essential cargoes. This phenomenon can be explained by the fact that cargoes can use alternative transport pathways. This is probably best exemplified in the import pathway of ribosomal proteins, which is mediated by at least four different import receptors (see above). Nuclear transport mediated by importins and exportins is strongly directional in vivo: importins bind their cargo in the cytoplasm and transfer it to the nucleus, whereas exportins interact with their substrates in the nucleus and mediate their export to the cytoplasm (Figure 2). Protein translocation through the NPC is thought to occur by an essentially similar mechanism for all importin-β-related receptors, except for the fact that, in some situations, additional adaptors are required to bridge the cargo-receptor interaction. The most-studied pathway is the import of classical NLS-containing proteins. This is mediated by importin β together with its adaptor importin α, which binds both the NLS-containing cargo and importin β in the cytoplasm. After a trimeric importin α-importin β-NLS complex is formed, importin β mediates docking at the NPC. In the presence of RanGDP and free GTP, this trimeric complex translocates through the NPC. Translocation is terminated by binding of RanGTP to importin β, which releases the complex from the NPC and dissociates importin α from importin β (reviewed in [1,12,69]). Free importin α has a lower affinity for the NLS cargo , and release from importin β is therefore believed to trigger release of the NLS cargo as well. Thereafter, the importin β-RanGTP complex, and importin α bound to its exportin (CAS) and RanGTP, are re-exported to the cytoplasm for another round of import [1,12,69]. A schematic representation of nuclear import and export cycles through the NPC. Typically, an import cargo is first recognized by its importin in the cytoplasm. The cargo-loaded importin translocates through the NPC into the nucleus, where the cargo is dissociated from the importin by binding of importin to RanGTP. The importin-RanGTP complex recycles back to the cytoplasm, where RanGTP hydrolysis is stimulated by RanGAP and RanBP1; this frees the importin for the next round of import. Binding of cargoes to exportins is regulated in a converse manner. Exportins bind their export substrates in the nucleus, forming a trimeric cargo-exportin-RanGTP complex. This complex is exported from the nucleus and dissociated in the cytoplasm by hydrolysis of RanGTP to RanGDP and inorganic phosphate (Pi). This releases the export substrate, and the exportin is recycled back into the nucleus. For details, see text. Transport in the reverse direction, mediated by exportins, is regulated in a converse manner (Figure 2) [1,12,69]. A paradigm for transport out of the nucleus is the export of leucine-rich NES-containing proteins. Exportin 1 binds to substrates containing a leucine-rich NES in the nucleus, forming a trimeric complex with RanGTP. This complex is then transferred to the cytoplasm by a mechanism involving binding of exportin 1 to the NPC. Once in the cytoplasm, GTP hydrolysis results in dissociation of Ran from the complex, allowing exportin 1 to release its cargo. Free exportin 1 re-enters the nucleus to bind and export additional cargo molecules. 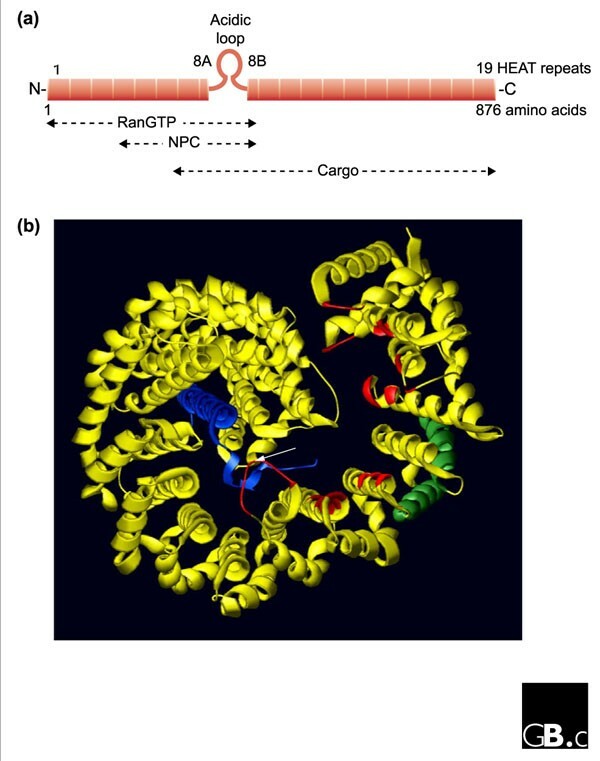 As illustrated in these examples, the RanGTP cycle plays a key role in conferring directionality to nucleocytoplasmic transport events [70,71] and RanGTP acts as a marker of the nuclear compartment for both nuclear import and export (Figure 2; reviewed in [1,12,69]). Remarkably, this model predicts that only a single molecule of GTP is hydrolyzed per import/export cycle; it strictly requires that RanGTP is highly enriched in the nucleus. It is thought that a steep RanGTP-RanGDP gradient is generated by the cellular compartmentalization of regulators of the Ran cycle. Specifically, the guanine-nucleotide exchange factor of Ran (RanGEF or RCC1), which regenerates RanGTP is nuclear and bound to chromatin . In contrast, the main GTPase-activating protein (RanGAP), and the Ran-binding proteins, RanBP1 and RanBP2, which stimulate GTP hydrolysis by Ran, are found in the cytoplasm [73,74,75,76]. This asymmetric distribution predicts that Ran is present mainly in the GTP-bound form in the nucleus, whereas Ran is immediately converted to a GDP-bound state in the cytoplasm. Recently, it was suggested that in addition to the Ran cycle, the NPC itself could provide an additional mechanism to ensure transport directionality . Given that several nucleoporins implicated in binding to importins and exportins have distinctive locations in the structure of the NPC, the asymmetric design of the NPC may also be important to efficiently drive nuclear import and export. Despite the large amount of progress that has been made in the nucleocytoplasmic transport field in recent years, many important questions remain unsolved. Many import and export receptors have now been characterized and their first cargoes have been identified. The further characterization of new transport receptors and adaptors, and the identification of new import and export substrates, will lead to a more complete picture of nucleocytoplasmic transport. A big challenge for the future will be to understand how translocation through the NPC occurs, and how nucleocytoplasmic transport is regulated. How does the NPC achieve its tremendous amount of selectivity? What type of changes in NPC conformation are required for passage through the NPC? To gain insight into these questions, a quantitative analysis of interactions between transport receptors and nucleoporins will be required. It will be also interesting to see whether an increasing affinity gradient of receptors for nucleoporins along the NPC exists and, if so, whether it makes an important contribution towards the direction of transport. Other issues that remain to be solved include the structural differences between members of the importin and exportin family. How does RanGTP dissociate import complexes in the nucleus but promote binding of export cargoes to exportins? A key mechanistic topic that is poorly understood is the export of RNAs and RNPs. Although a tRNA-export factor has been identified, the mechanism of rRNA or mRNA export is still poorly understood. Several proteins in S. cerevisiae, such as Mex67p and Yra1p, and their metazoan counterparts TAP and Aly, have been indicated to play an important role in mRNA export. Mex67p/TAP does not belong to the family of importin-β-like proteins, suggesting that there are alternative translocation pathways through the NPC. Future studies will provide insights into these important questions.